Updated Friday, Aug. 25, 2017, 8:30 p.m. EDT: On Friday, Donald Trump gave a presidential pardon to the former sheriff of Maricopa County, Ariz., who was convicted of intentionally defying a judge’s order in an immigration case that has cost the state of Arizona millions in legal-defense bills because of the sheriff’s actions. The White House announced that 85-year-old Joe Arpaio was a “worthy candidate” for a presidential pardon, according to the Washington Post. So here we have proof of where the president’s priorities lie. They are not with the good of the American people; rather, they are with protecting his own self-interests. There is no reason a sheriff who defied a court order simply so that he could continue to illegally harass Latinos in his state should be going free, but of course, our president thinks differently. 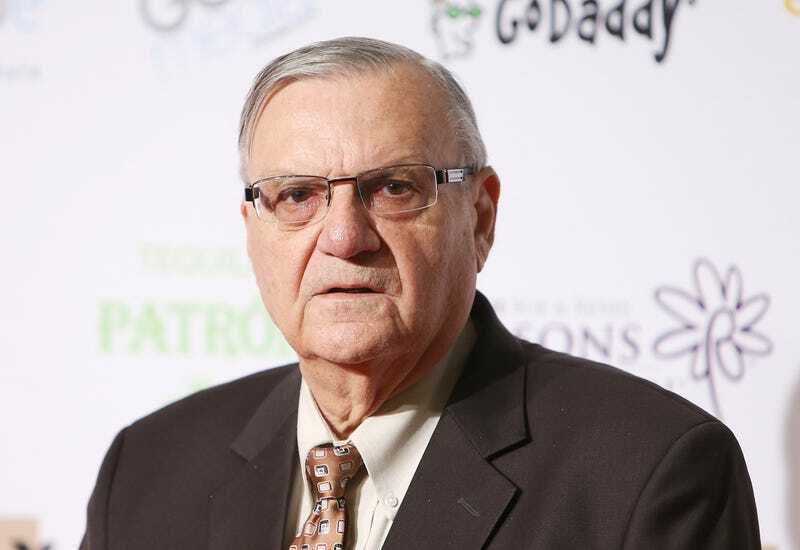 Joe Arpaio is the former sheriff of Maricopa County in Arizona. Calling himself “America’s toughest sheriff,” he built a reputation as a tough lawman in Phoenix over the last two decades by making inmates in his jails wear pink underwear and sleep outside in tents during hot Arizona summers, and conducting aggressive immigration patrols. Of all the inhumane policies Arpaio instituted and participated in, it was the immigration patrols that landed him in hot water. A judge ordered Arpaio to stop the patrols after Latino drivers complained that they were the targets of racial profiling. Arpaio admitted that he violated the judge’s order, but he claimed that he did so “unintentionally.” Federal prosecutors charged Arpaio with criminal contempt of court in October, and he was found guilty last month. Arpaio is scheduled to be sentenced in October, but at a rally in Phoenix Tuesday night, Donald Trump hinted that he would soon pardon Arpaio, and CNN reports that the paperwork for him to do so has already been prepared. In addition, a Trump administration official told CNN that the White House has prepared talking points for surrogates to use once Arpaio is pardoned. And there it is, good readers of The Root. It is constantly being thrown in our faces how members of law enforcement are seen as being above the law and above reproach. Joe Arpaio violated a judge’s order. He was specifically told to stop his immigration patrols, which basically targeted anyone who looked Latino, stopped them and asked them to prove that they were in the country legally, whether or not they had committed or were suspected of committing a crime. “Where are your papers” was not just a saying but a way of life for Arpaio. And then there’s the fact that the Tent City “concentration camp” (his words) he built outside a Phoenix jail 24 years ago is only just now closing, after more than 20 years and multiple lawsuits alleging inhumane treatment, overcrowding and dangerous living conditions. This is not a man who was looking to keep people safe. This is a man who was acting out his own perverse prejudices and vendettas against people who were powerless against him. That in and of itself needs to be punished. But because your president is a racist who supports other racists and doesn’t care about anyone else but himself and his racist little friends, Joe Arpaio, the most racist sheriff ever, may be a free man before he is even sentenced.